This release sees a semi-stabilisation of the gameplay in favour of implementing a variety of bugfixes and user requests. 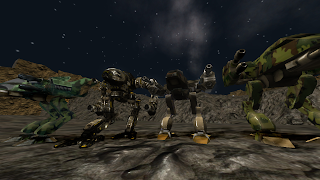 We've removed some old cruft and implemented a few new game types to replace them, like coop (humans fight high powered bots), and king-of-the-hill (control and defend one flag). Due to the popularity of the impulse/parkour system we have introduced a new "impulse vaulting", where you can hold down your parkour key to "vault" over low obstacles, making it that much easier to navigate around busy levels. But you can read up on the full changelog in the release thread on our forums. Oh and maybe you can help them out and create a new teaser video for their website? On our forums I was also recently reminded of a Red Eclipse based mod called MekArcade (see more infos on their Moddb site), which as you can guess adds Mechs to the game. Information is otherwise relatively sparse (I couldn't find any word on their media license for example... but given RE's CC-By-SA licensing scheme I hope they sticked to the same), but they plan to release a first version relatively soon (Maybe they waited for the RE 1.3 release? ).